Consumers who pre-book can purchase Samsung U Flex, a premium Bluetooth device worth Rs 3,799 for Rs 999 only, the company said in a statement. "Our recently launched Galaxy A line has seen an unprecedented success since its launch. It has reached a milestone of $500 million in sales within 40 days of launch," said Ranjivjit Singh, Senior Vice President and Chief Marketing Officer of Samsung India. Samsung Galaxy A20e Smartphone With 5.8-inch Infinity V-Display Launched: Price, Specifications & Features. Galaxy A70 comes with 32MP triple rear camera capable of shooting super slow-mo videos. The device has a 4500mAh battery with 25W super-fast charging capability. "With its best-in-class display, Samsung Pay, path-breaking triple rear camera and top-notch processor, the Galaxy A70 is all about experience," Singh added. Samsung's New Galaxy A80 Phone Features New Infinity Full-Screen Display & 48MP Rotating Camera. For Selfie buffs, there is a 32MP front camera with features like AR-Emoji and Selfie-Focus. 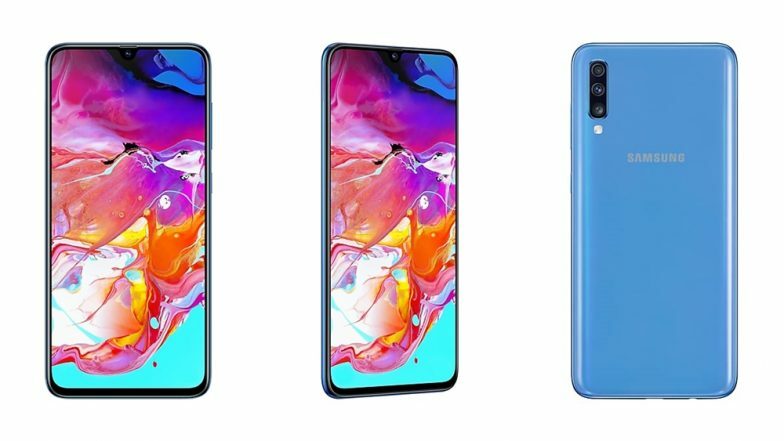 Starting May 1, Galaxy A70 will be available for sale in three colours -- white, blue and black. Galaxy A70 will also be available on Flipkart.